A protester holds up a sign targeting Salesforce CEO Marc Benioff outside the company's headquarters in San Francisco on Monday. There's always been a kind of idealism undergirding the West Coast tech scene. Todd Gitlin, a professor of sociology and communications at Columbia University, says "tech-utopianism" grew up out of the hippie movement in the 1960s and '70s. "There was this dreamy ideology ... that when everybody had this stuff, they could use it for public good," he says. You can see echoes of that era in the idealistic mottos and mission statements of many big tech companies. Google began with the motto, "Don't be evil." (It was recently removed from the company's code of conduct. Facebook's mission statement says it is committed to bringing the world closer together. The CEO of Salesforce, which builds software for businesses, loves to tout the company's values. At its annual Dreamforce conference in San Francisco, Marc Benioff whipped up the crowds with a speech when he spoke about human rights. "We've fought together — whether it's for LGBTQ equality across the country, that's been so important for us," he said, "or fighting for women and gender equality and gender pay equity." Now the outspoken CEO is caught up in the nation's debate about immigration. Earlier this week, a handful of protesters outside Salesforce's environmentally friendly tower in downtown San Francisco called on the company to live up to its values. They came to support the more than 650 Salesforce employees who signed a petition asking Benioff to end the company's software contract with U.S. Customs and Border Protection, or CBP. The workers are upset over the agency's role in the treatment of migrant families and their children. So far, Salesforce is keeping the contract to supply software to CBP to manage human resources. In a tweet, Benioff said the company doesn't work with CBP "regarding separation of families." It's a practice he says he doesn't support. He's even donating $1 million to organizations that help families separated at the border. But that's not enough for tech workers like Kevin Ortiz. "Salesforce has the obligation both morally and ethically to actually stop all practice with CBP regardless of what the relationship is, in order to cripple CBP," he says. "This mantra of 'Oh yeah, we actually listen and care deeply about our employees' is finally starting to crumble," he says, "because people are seeing the industry for what it really is, which is just like any other industry that's focused on making money and enriching their shareholders and CEOs." But she thinks there is a reason this is happening at tech companies. "The organizations encourage responsibility by having generally flatter hierarchies," she says. "They encourage people to challenge and debate. They encourage people to test the status quo." Case in point: In response to the petition, Salesforce CEO Benioff also tweeted: "I'm proud to work with 30K employees who make their voices heard and serve their communities." Gitlin, the Columbia University professor, says there is a precedent for scientists and engineers refusing to work with the government on a technology. After the U.S. used the atomic bomb in Hiroshima and Nagasaki, many of the scientists who worked on it were horrified. One of them was Robert Oppenheimer, known as the father of the atomic bomb. He "actually was deprived of his security clearance because he didn't want to work on the hydrogen bomb," Gitlin says. And while most of the big tech companies aren't in the business of building bombs, many workers, like the anonymous programmer, now see how the technologies they build are a doubled-edged sword — social media can connect people and also spread fake news; facial recognition can catch criminals or be used by authoritarians to track their citizens. "We have the power to stand up and say we won't do that," he says. "That's not the future that we want to see. We want to show that there's a different future possible where tech isn't used for human rights abuse." Tech workers from Salesforce, Microsoft, Amazon and Google are putting pressure on their CEOs to cut ties and end contracts with some U.S. government agencies. It's rare for employees to tell their bosses to turn away business. But as NPR's Laura Sydell reports, there's a growing concern among tech workers that the cutting-edge tools they create can be used in immoral ways. LAURA SYDELL, BYLINE: There's always been a stream of idealism at the major tech companies. Google started with the motto don't be evil. Facebook's mission statement says it's committed to bringing the world closer together. The CEO of Salesforce, which builds software for businesses, loves to tout its values. Here's Marc Benioff at the company's annual conference. SYDELL: Now the outspoken CEO is caught up in the nation's debate about immigration. Earlier this week, a handful of protesters outside of the Salesforce tower in downtown San Francisco called on the company to live up to its values. UNIDENTIFIED PROTESTERS: (Chanting) Hey, hey, ho, ho, CBP has got to go. 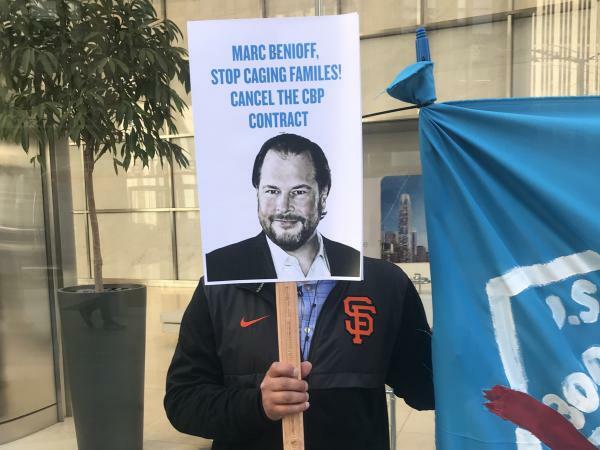 SYDELL: The protesters are here to support the more than 650 Salesforce employees who signed a petition asking CEO Benioff to end Salesforce's software contract with the U.S. Customs and Border Protection, or CBP. They're upset over its role in the treatment of migrant families and their children. So far, Salesforce is keeping the contract to supply software to manage human resources. In a tweet, CEO Benioff said the company doesn't work with CBP to separate families. He agrees separating families is wrong. But that's not enough for tech workers like Kevin Ortiz. KEVIN ORTIZ: Salesforce has the obligation both morally and ethically to actually stop all practice with CBP, regardless of what the relationship is, in order to cripple CBP. SYDELL: Whether Salesforce has a moral obligation may be debatable to some, but tech employees say they are proud of the values these companies promote. In fact, the demonstrators came from a variety of tech companies. And while they are speaking out, many like this programmer at a large company didn't want to use their names because their employers might retaliate. UNIDENTIFIED PERSON: This mantra of, oh, yeah, we actually deeply listen and care about our employees is finally starting to crumble because people are seeing the industry for what it really is, which is just like any other industry that's focused on making money and enriching their shareholders and CEOs. SYDELL: The Salesforce protest is part of a growing movement among tech workers. Employees at Google successfully pushed for an end to a contract with the Pentagon, which was going to use its technology for more targeted drone strikes. Amazon employees want the company to cancel contracts with law enforcement for facial recognition technology. At Microsoft, some programmers have threatened to quit rather than build software for ICE. Jennifer Chatman, a professor at Haas School of Business University of California Berkeley, says it's almost unheard of for workers to ask their employer to stop doing business with a particular client. But she thinks there's a reason this is happening at tech companies. JENNIFER CHATMAN: The organizations encourage responsibility by having generally flatter hierarchies. They encourage people to challenge and debate. They encourage people to test the status quo. SYDELL: Todd Gitlin, a professor of sociology and communications at Columbia University, says there is a precedent for scientists and engineers refusing to work with the government on technology. After the U.S. used the atomic bomb in Hiroshima and Nagasaki, many of the scientists who worked on it were horrified. TODD GITLIN: And one of them was Robert Oppenheimer, who actually was deprived of his security clearance because he didn't want to work on the hydrogen bomb. SYDELL: Oppenheimer is known as the father of the atomic bomb. And while most big tech companies aren't in the business of building bombs, many like this anonymous programmer do see how the technologies they build are a double-edged sword. Social media can connect people and it can spread fake news. Facial recognition can catch criminals or be used by authoritarians to track their citizens. UNIDENTIFIED PERSON: We have the power to stand up and say we won't do that. That's not the future that we want to see. We want to show that there's a different future possible where tech isn't used for human rights abuse. SYDELL: And these workers hope that this is the beginning of employees speaking up to their bosses about how the technology they build gets used. Laura Sydell, NPR News, San Francisco. MONTAGNE: And we should note Salesforce is a financial supporter of NPR. Transcript provided by NPR, Copyright NPR.